Shh Shh, do you want to know some more of their secrets? 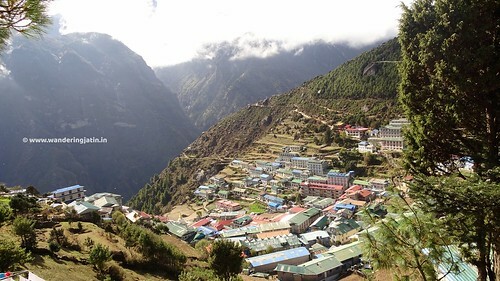 in that mountain town… Namche. 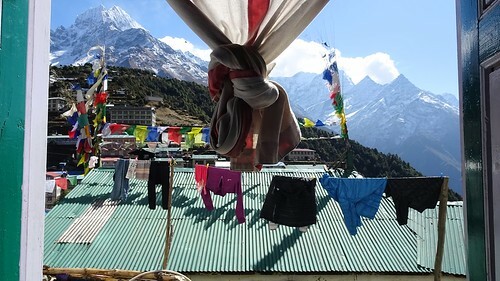 My time in Namche Bazaar (altitude 3400m) was quite dreamy: the view from the room/cafe/lodge that I was staying in with Ramesh was epic, I will address it as ‘home’. 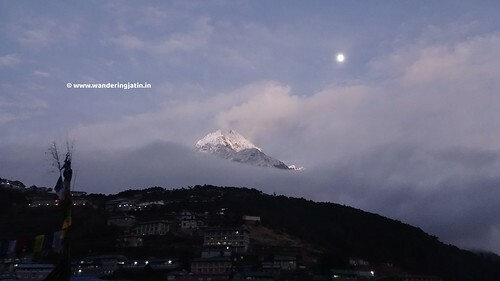 Exiting my home upon waking up, I was dumbfounded when I saw Namche sitting in the lap of Thamsherku. I turned to Bhabhi g and Bhaisaab, and I told them, “You are so rich! You live in heaven! What people come here for, you can see that right from your kitchen!”. They laughed and shied away from the word “rich”, and it dawned upon me once again that we are all looking for what we don’t have, and the chase is never ending; in fact that chase itself for the wants is probably what life is. Ramesh had invited me to stay at his property, and it was very confusing for me when I entered “his property”. It was a local house – just one big room, with many beds adjoined. This was the living room, study and also, the kitchen! It was almost dark when I arrived, and the room was lit with a low voltage bulb under the light of which a party of little students was immersed in their books, in a very busy manner. Four they were, and four were their styles (the permutations and combinations of hats, caps, backpack – on and off, using the centre table, or using not, mugging loud or within, etc.) and also, four were their subjects, but collected they were around their pretty teacher, one, who too seemed pretty engrossed in them. 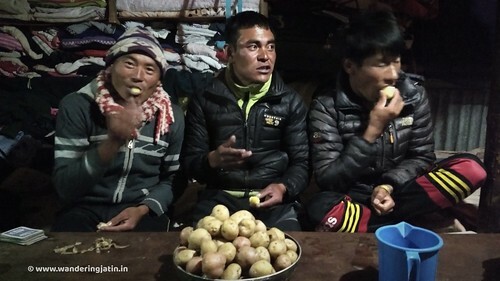 Also gathered on the beds was a group of sherpas, chit-chatting, videos on mobile watching and card playing. I was the centre of attention in no time – fancy trek boots and tidy feet probably didn’t belong to a group of withered shoes, and blistered and smelly feet. 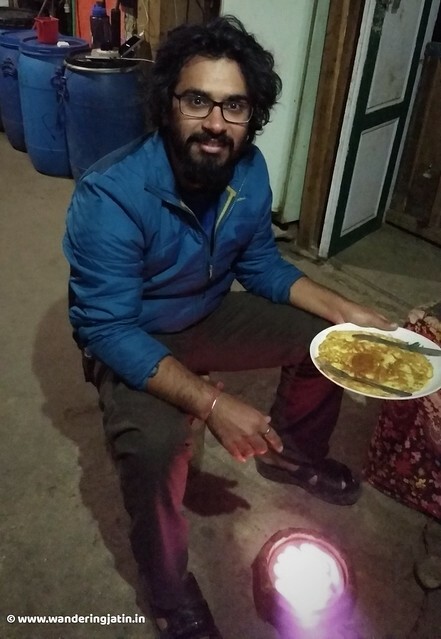 They were welcoming though, very much that too, so much so that Ramesh would often leave his game of cards to come to me and enquire if I needed another serving when I sat down for dinner, later. But before that, I took a nap, the teacher left, some of the students left and the others engaged in Doraemon, Chhota Bheem and other cartoon serials, in Hindi no less! 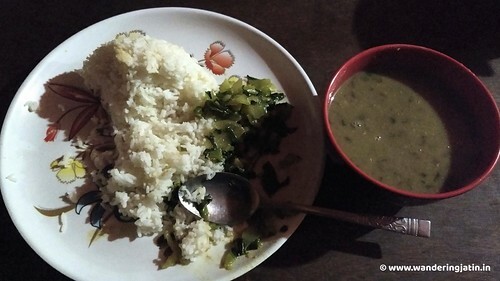 Bhabhi g and Bhaisaab – the couple who was the caretaker of that property, served me Daal Bhaat, often employing Ramesh to serve as the language mediator. 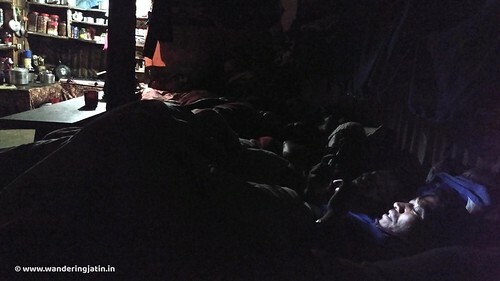 I slept eventually sharing my bed with ten or more of them – some still chit-chatting, some absorbed in their phones and some already snoring, feeling wowed for the experiences that I was living. So yea, I call it home. 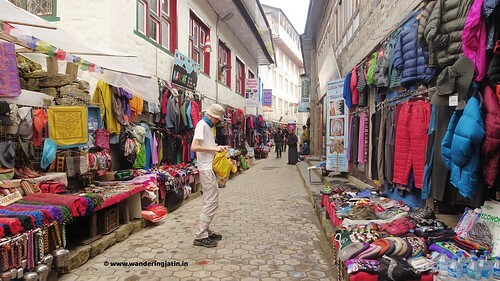 The morning next, I ran into Charmaine from Australia even before breakfast when I was basking in the Sun right outside my home, lost in Kongde, and later did the “acclimatisation hike” to Sagarmatha National Park museum with her, guided by Ramesh. 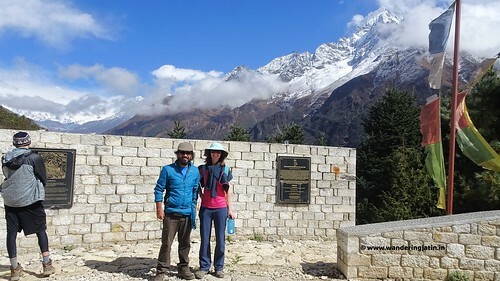 That was a good small hike to the museum and the Tenzing Norgay Sherpa statue, and we could see the summit of Mount Amadablan in the distance. 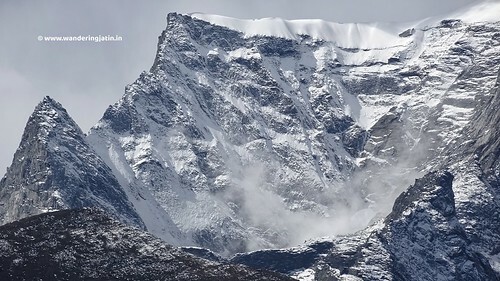 Once up there, we had a very clear view of the summit of Mount Amadablan, but the Everest was completely blocked by the clouds. 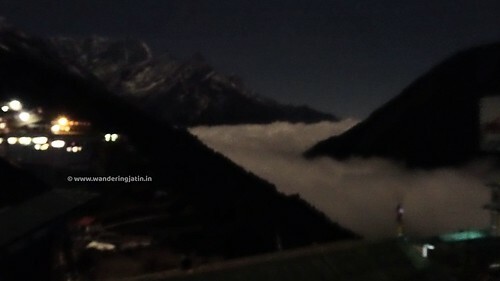 We also tried to see Lukla from up there, oh the clear weather and the cold wind which blew up there! 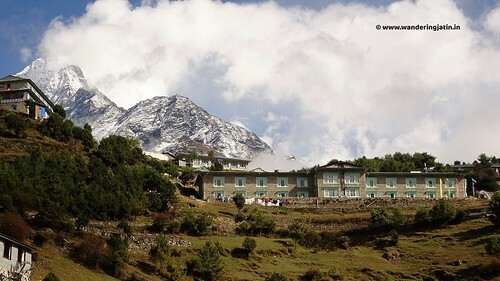 The walk back gave some impressive views of the school and the Namche town below us. I ran into Vishwas and Rita many a times that day, heard them talking at length about their gear and plan, contemplated over their suggestions to get the trek poles and wet wipes, and fixed at 730 am to start the trek together the next day. I also interacted with many more trekkers and heard them again talking at length about their plans. I was funnily silent when they asked about my plans because I had none. In fact, I finally bought my route map at Namche to at least keep up with all the names of the villages the folks were reciting. I decided to shed off the unnecessary items (my laptop for one, haha!) at Namche with Bhabhi g, to collect on my return. Travel Rewind 2017 - The Highlights! That was lovely. I always wanted to trek the Himalayas, but i guess it is too late now. Thank you. 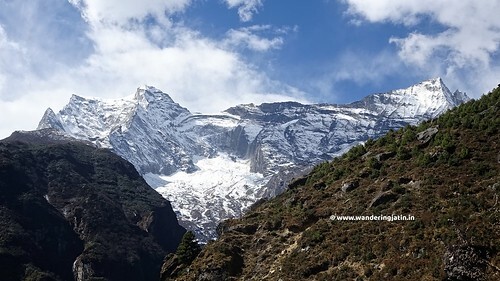 🙂 Arre nahin, it is never too late, I have seen people of all ages trekking up there, mental strength with preparing for physical strength is needed. 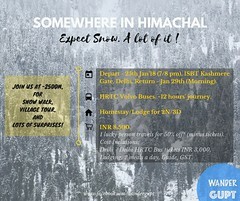 Hope to see you there some time, trekking in the Himalayas. Sure man, let’s together some time. Thanks a lot, I am glad you could feel the place. Cloud river indeed was a sight to behold. Wow…beautifully described in detail. Just felt the place sitting at home. Lovely pictures. This is such a feel-good feeling when my reader can connect with the place, my objective thus, gets fulfilled. Thank you so much!